Sapphire Circuits LLC is pleased to announce its first prototype, the MudWatt Wireless Weather Station. 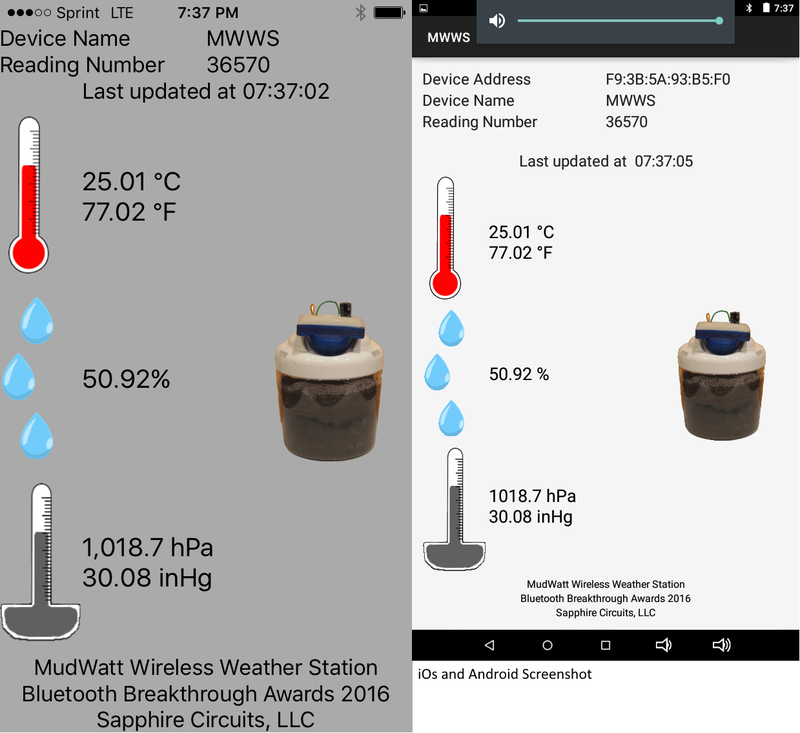 What exactly is the MudWatt Wireless Weather Station (MWWS)? The MWWS is an energy harvesting environmental sensor that gathers temperature, humidity, as well as air pressure information and broadcasts it wirelessly using Bluetooth Smart Technology. What makes this particular prototype unique is its energy source. 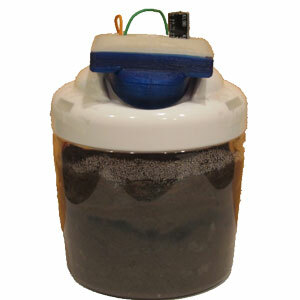 The device is powered solely by bacteria living in a jar of mud. The prototype contains an energy harvesting circuit that gathers electrons expelled by the bacteria as a byproduct of their respiration. It then utilizes this energy to collect environmental data, using on-board sensors, and wirelessly broadcasts this information to nearby smartphones, tablets, and computers. As you can imagine (or measure) the power output of these fuel cells is significantly less than traditional power sources. However, the Bluetooth radio and embedded electronics are so efficient, it can operate on this modest power supply. The current prototype's maximum update rate is once per minute, but the average is typically once every 2-3 minutes. This is impressive considering all of the energy is harvested from a small jar of mud. The prototype was specifically designed as an accessory to work with the MudWatt family of Microbial Fuel Cells made by Keego Technologies LLC. These MudWatt kits are used as educational teaching tools as part of a STEM (Science, Technology, Engineering, and Mathematics) school curriculum. For more information about the MudWatt family of Microbial Fuel Cells go to www.MudWatt.com. To observe the temperature, humidity, and air pressure information transmitted by the MWWS, there are beta apps for both Android and iOS. These allow the sensor information collected by the device to be viewed in real time. Sapphire Circuits, LLC is a small engineering design consulting company specializing in electronic circuit design and embedded programming.